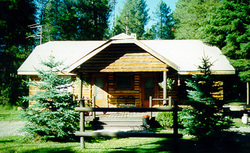 Glacier Cabins offers 5 clean, comfortable log cabins, 3 with kitchenettes, 1 with a fireplace and one with 2 bedrooms. Rustic outside, remodeled inside. Barbecue grills & picnic tables are located by each cabin. We are only 8 miles from Glacier National Park and minutes from the Hungry Horse Dam, hiking, fishing, bicycle path, rafting, horseback riding and golf. Directions: Glacier Cabins are located at 9478 Highway 2 East in Hungry Horse, Montana. We are just 8 miles from Glacier National Park.